Do you browse Pinterest and pin activities but find that you never actually do them with your kids? Do you never have the right supplies for the activities you do find, so you can’t do them? Do you keep making excuses over and over again that keep you from spending quality time with your child? I understand that overwhelming feeling of wanting to do activities with the kids, but never seem to actually “getting to do them”. Now, you can get a complete resource of activities you’ll actually do. You’ll love exploring these 140 hand-chosen activities with your kids through toddler-hood and their preschool years. You’ll be guided on how to find that extra 15 minutes (that you don’t have) to make time for the most important part of your life: your family. Accountability plays a HUGE role in how I keep doing activities with my kids. It really does help to have that extra little push to do a simple activity and a time frame to do it in! However, the last thing I want to be stressed out about is preparing for fun with the kids. That just seems silly. It’s supposed to be fun! These are weekly activity plans made for toddlers and preschoolers! The activities in these plans are ones that you’ll actually do. 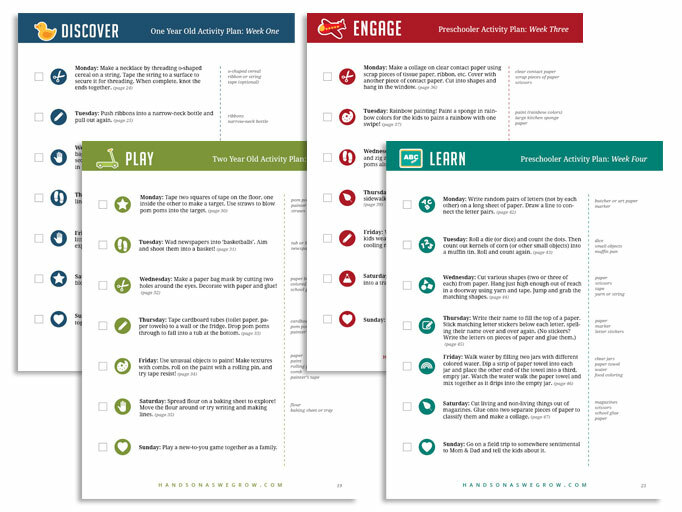 I’ve created 4 sets of printable activities, planners, and how-to guides. 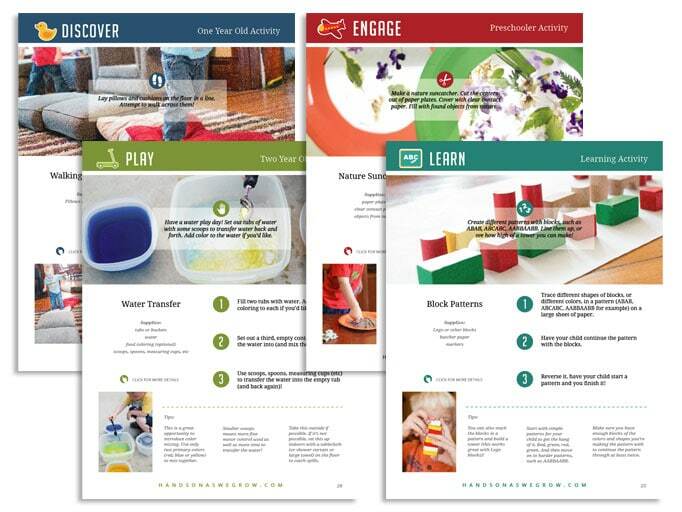 Each set covers five printable weeks of 35 activities to do with your child (a total of 140 activities). These activities are the heart of the eBooks and are what sets these apart. They are the simplest of activities that use the supplies you have. Having a week of simple activities pre-planned makes it super easy to actually do them with your child. By having a simple place to come back and check off that you did the activities gives you a sense of accomplishment. You’ll have that little push you need to help you go ahead and have some fun with the kids! While the five weeks of activities are the heart of the eBooks, the Go-To Lists are my favorites. They’re lists of all the different types of activities (there’s 5 of these lists total in the set of books) with literally over 100 activities for all the ages to do! These are great activities to substitute during the five weeks if you don’t have something on hand (which is unlikely since the supplies are all very common) or to use in your activity planning going forward. Forget the hours of trying to find an activity with supplies you have. Don’t waste your time trying to decide if the activity is suitable for the age for your child. I have been looking for something like your books for 3 years now since I became a full-time Mum. I am quite a busy person who, to be honest, simply doesn’t have the time or the energy to be super domesticated child education Mum. But these activities are really really easy to set up, and you are right, I DO have most of the stuff at home (I don’t mind putting the odd thing on the grocery list for them e.g. hair gel haha), so I can actually see myself doing these things with my kids. I think you are a genius and I will be telling all my friends about these books. I also have a 6 week old baby boy so I am going to get years of use out of them. – Sarah A.
I’ve just started using weekly activity plans with my kids! I just wanted to say a big thank you! I’m a mum of two – 4 year old daughter and 7 month old son and I’ve found it somewhat a struggle to even get us all dressed and out the door most days, let alone be creative and actually do activities with my kids! I’ve struggled with the lack of activity as I was very much hands-on with my daughter, but since my son was born it’s been so hard! However, I feel I’m coming out the other side finally and with your help I’m managing to find my feet!! So thank you so much from the bottom of my heart for showing me a way that I can reconnect with my daughter and get back to being a hands on mum! – Karri B. Weekly Plans Format: PDF digital downloads, 8.5″ x 11″. Four eBooks, each 81 pages. What age is considered “Early Years”? The Early Years are from birth through preschool in my book. The Early Years Bundle focused on 1 year olds through 5 year olds. I consider preschool age to be from older 3 year olds through 5 years old. The preschool weekly activity plans are put together with that age in mind, however many older kids would likely still enjoy them. The toddler age is from walking 1 year olds to younger 3 year olds. How will I receive the Early Years Bundle? 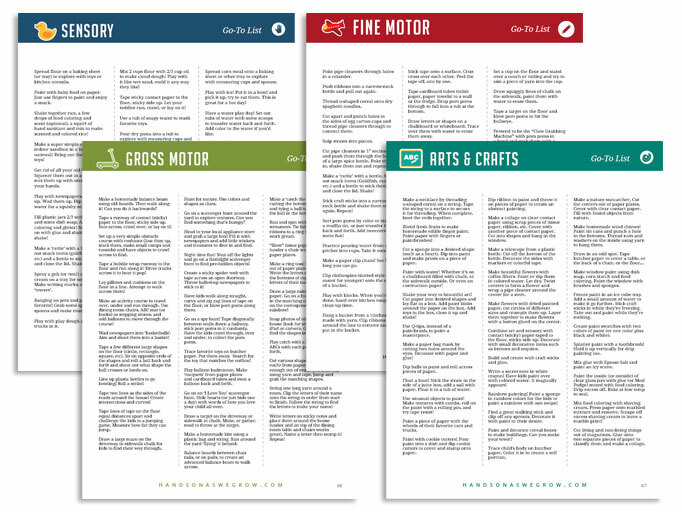 There are 4 different books in the Early Years Bundle, each with 2 PDF downloads (a total of 8). Each book has a full pack version and then a printable version with just the weekly plans and other printables to make it easy to print off. Immediately after purchase, you will be directed to a page that will have links for easy download. You will also receive an email with the download links as well as login information to log in from any device of yours at anytime (now, 2 weeks from now, 2 years from now… it doesn’t expire). Your login will direct you to a page that hosts all your available downloads. Currency of Purchase: All prices are listed in US dollars. Can I return any of the eBooks? 100% satisfaction guaranteed. The eBooks are a digital download, so no, you cannot actually ‘return’ it. But I do offer a 14-day money back guarantee. With a 14-day money back guarantee you can purchase the eBook today. If you find it isn’t a right for you, you get your money back. Is this site secure? Yeppers! Your transactions and account information is secure! No worries. How do I open the eBooks? The eBooks are in PDF format, you will need Adobe Reader to open them (download it here). Can you mail me the activity plans? You can order print versions of the books on Amazon to have mailed to you. Can I earn money by promoting these? Yes. You can become an affiliate and earn 50% of any sales you make! Share away!